As you all know, I LOVE puff pastry. It’s so versatile and delicious both savory and sweet. 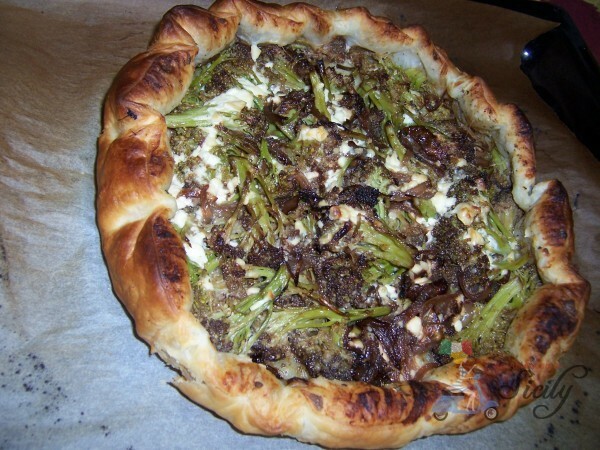 Here in Sicily, it’s quite common to find puff pastry used in savory dishes. So one morning as I was thinking about something quick for dinner….remember, I fear the wrath of my 8 month old’s strong lungs!….it came to me. 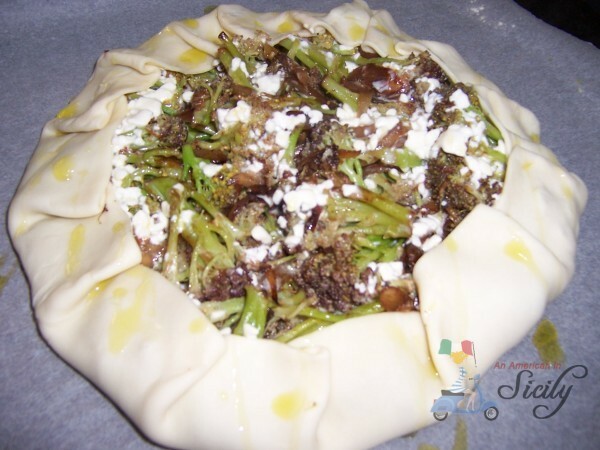 A puff pastry tart filld with sauteed broccoli, onions, wine and garlic topped with a drizzle of melted cheese. It was delicious =) I’m going to show you how it’s done, so come in the kitchen! Now, here is hpw we put it all together……. 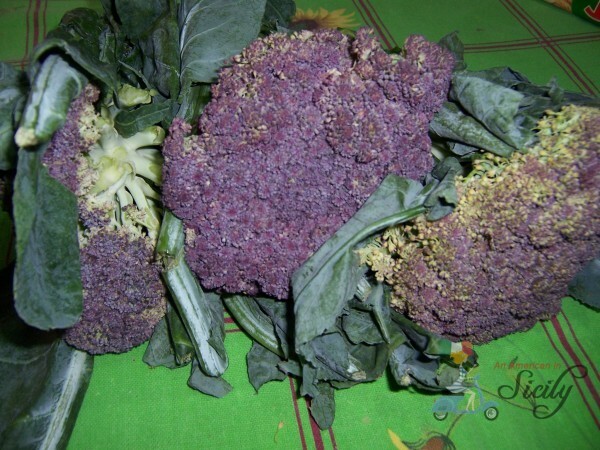 My beautiful fresh broccoli…I cut and washed the florets. 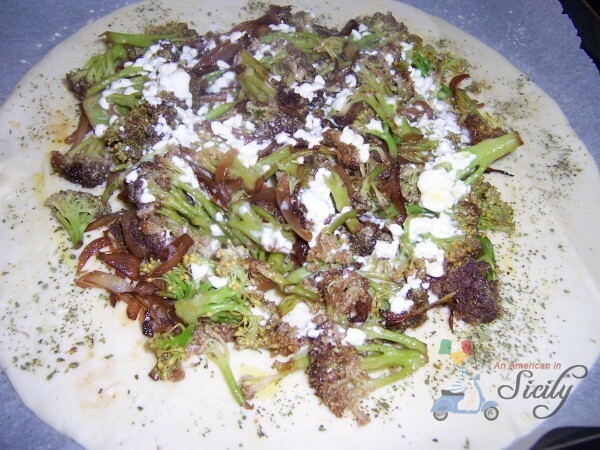 Place the broccoli in a medium sized stockpot or pan. Add th onions. Add 2 Tbsp of olive oil and saute over medium low heat until nice and golden. Add 2 generous splashes of red wine (…here, I am using marsala, my favorite cooking wine, however you can use any red wine you have on hand). 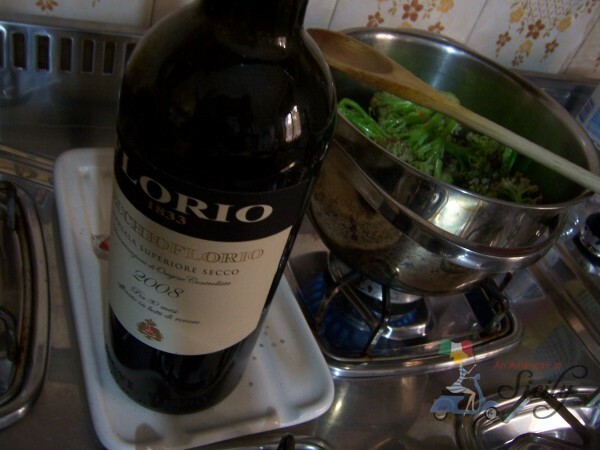 Stir a bit and cook for any additional minute or two to allow the wine to infuse the broccoli mixture. Turn off the heat and set aside. 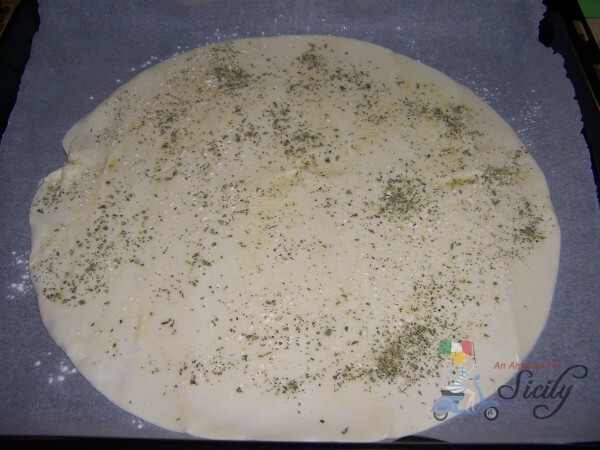 Roll or lay out the puff pastry. 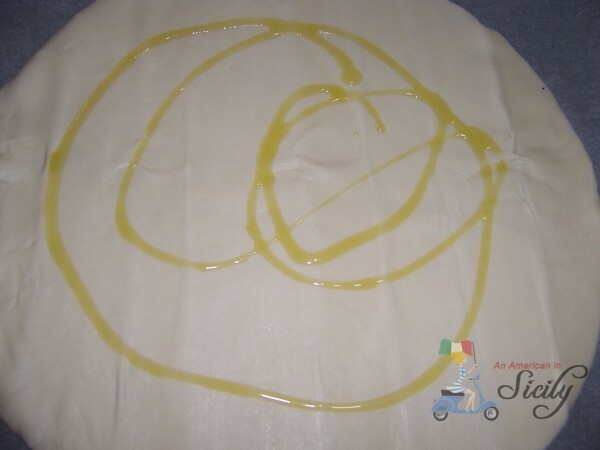 Brush with olive oil then generously sprinkle garlic powder and oregano all over the puff pastry. 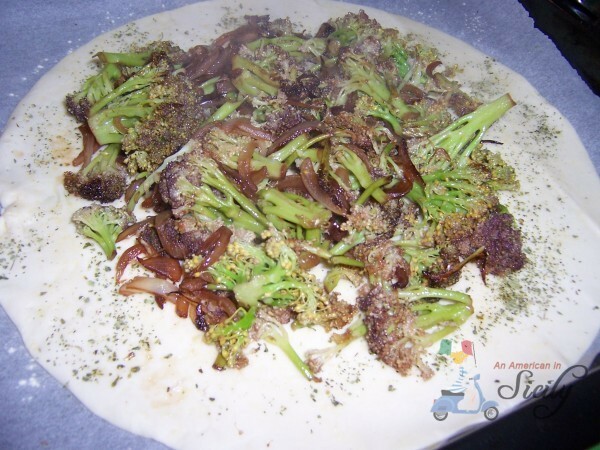 Add the broccoli mixture in the center….you can see my broccoli was still hot as it fogged up the picture!…. Next, melt the cheese over low heat, adding some water to make it nice and runny….Don’t add too much water, you don’t want it so watered down you lose the cheese flavor…a tbsp or two of water should be enough…. Drizzle the cheese over the entire tart. It’s ok if some parts of the cheese are clompy…then will melt in the oven. Last but not least, sprinkle some more garlic powder all over the tart. Fold over and pinch the ends towards the center. Drizzle some olive oil all over the tart and bake at 350 F or 175 C for 25-30 minutes or until puffy, nice and golden along the edges. So go ahead and try it….it’s deliciously light and easy to make!